Members of USGBC Ohio gathered in July at Rumpke Recycling’s $35 million facility in Cincinnati to learn more about zero waste and local recycling assets. MaryEllen Etienne, the community's Region Manager and a TRUE Advisor, provided an introduction to zero waste and an overview of TRUE, GBCI's zero waste program that certifies physical facilities and technical advisors. 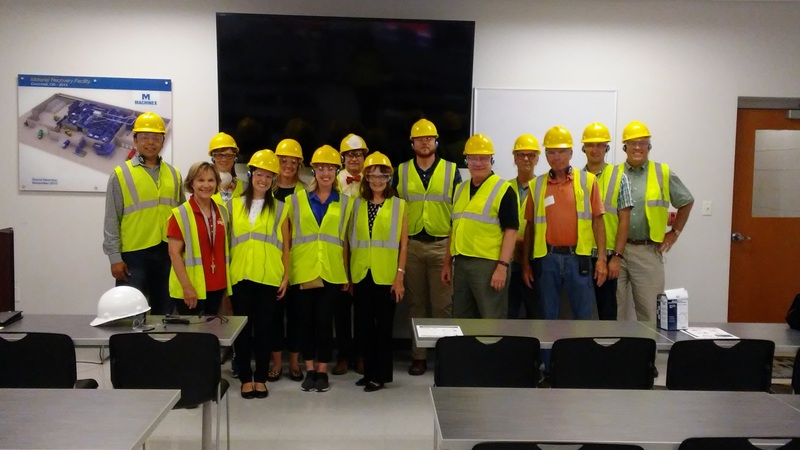 Anne Gray, Rumpke's Education Specialist, walked the group through the Materials Recovery Facility (MRF), one of the most advanced recycling facilities in the United States. Along the way, she explained the recycling process, from post-consumer recycling collection to sorting, and how Rumpke sells sorted materials to be used as feedstock for new recycled-content goods. The system, a mixture of highly sophisticated technology and manual sorting, is capable of processing more than 60 tons of recyclables each hour—about the same amount of time we spent touring the facility. The tour group also learned about another side of recycling: its economic impact. Gray explained that recycling is not only a profitable practice, but also provides a wealth of jobs. For example, in Ohio, recycling supports 3,177 businesses, employing 98,302 people. The need for these resources isn't just an economic one, though. With the average American generating one ton of trash each year, we have to start determining ways to minimize that number, as well as to find alternate avenues for the refuse. An interesting topic came up during our tour of why only certain items were recyclable in the Cincinnati area. Gray explained to the group that in order to accept a material, the company needs the ability to sell the product after it is processed and prepared at the MRF. Number 5 plastics could be processed there, for example, but Rumpke can't find buyers for it. This reality should urge us to reconsider our own consumption. Along with purchasing recyclable packaging, we must also reach for the products that are made from post-consumer recycled content, to ensure recycling continues to be viable. USGBC Ohio thanks Gray and the entire Rumpke team for providing our chapter with such an eye-opening experience and for promoting and executing the sustainability goals of the USGBC every day.